4 of the Greatest Exercises for you! After spending years working in gyms and on all kinds of fancy equipment some of the greatest exercises I have come across are Pilates-based exercises on the mat, ball, and with no equipment at all. When I think of the greatest exercises for you what comes to mind is working all the major muscle groups of the body. These exercises work many different muscle groups simultaneously. They are generally done without any special equipment except maybe a ball for instability. What’s great about these exercises is that they all work the muscles of the core or torso of the body for stability while moving the arms or legs simultaneously. The squat is a simple and particularly good exercise because it imitates daily activities of bending down and picking things up. This exercise works all the major muscle groups of the legs. 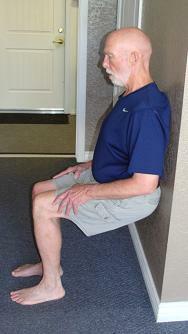 When squats are done consistently over time as you age you will never have trouble getting out of your sports car, a soft sofa, off the floor, and most importantly squatting over a toilet or in the woods. When doing a squat the weight should be in your heels as you bend your knees keeping the chest lifted and spine straight. Keep your navel pulled to your spine to protect the back. Squats can begin as simply as standing and sitting from a chair to more advanced moves as holding a barbell across your shoulders in a squat rack. The push-up, similar to the squat, works all the major muscle groups of the upper body. When done on an exercise ball it simultaneously works the core or abdominal muscles as well. 1. Position your stomach on the exercise ball and roll out walking your hands out until both legs are off the floor and parallel to it. Your pelvis is in the center of the ball; if you walk out to your thighs it becomes more difficult. 2. Bend your arms lowering your chest to the floor between your hands then press yourself back up. Repeat until you are fatigued, 10-20 repetitions. 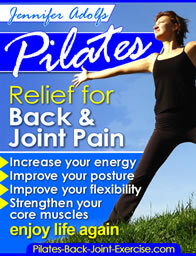 Check out this and more greatest exercises in the new Pilates Core Ball Exercise DVD available here. The Pilates Bridge is one of the good back exercises, as well as one of several good ab exercises found on this Pilates site. It not only feels good to stretch and open the spine but it also strengthens the abdominal and pelvic floor muscles that help to stabilize the spine. 1. This exercise is performed by lying on your back with your feet under your knees and hip width apart. 2. As you exhale curl your tailbone off the mat simultaneously lifting the hips off the floor pressing into your feet and shoulders evenly as you are lifted through the hips all the way up. 3. Take a breath at the top and then exhale as your roll the spine back down the mat one vertebra at a time. Repeat for 6-8 repetitions. The Pilates Teaser is one of the good ab exercises found in the Pilates exercise sequence to work the deep abdominal muscles specifically. Isn’t that what everyone is looking for? Unfortunately this is also a very difficult exercise to perform correctly. 1. In it’s pure form you would simultaneously from a lying position come up into a balanced V-Sit with the upper and lower body lifting at the same time. 2. A modified way to prepare you for this exercise would be to balance on your tailbone with your knees bent up, and then lower your upper body peeling it down the mat, and then back up again.